Janakpur, 75,000 inhabitants, is a city in the Dhanusha District, southern Terai, Nepal, approximately 200 km south-east of Kathmandu, 22 km from the Indian border. The city is centre of the ancient Maithili culture with its own language and script. Janakpur also is the birthplace of Sita Devi, a Hindu goddess (also called Janaki), the heroin of the Ramayana epos and it is the site of her wedding with Rama, a Hindu god. King Janak is supposed to have found baby Sita in a furrow of a field; he took the child home and raised it. When she was a young lady the king announced that she should be wed by whoever is able to string the devine bow of Shiva. That was no other than Rama, a prince from Ayodhya. Thus, Janakpur is an important pilgrimage site for Hindus. The centre of Janakpur is dominated by the Breitling Superocean Replica impressive Janaki Mandir to the north and west of the bazaar. This temple was built in 1911 and is in many aspects reminiscent of islamic architecture. Another landmark of Janakpur are the numerous sacred ponds for ritual baths (sagar) all over the city. The 2 most important ones are close to the centre: Dhanush Sagar and Ganga Sagar. Sitamadhi:-The name of Sitamadhi is on the name of Sita. She is the wife of Maryada Purushottam Rama. He is the king of Ayodhya. It is lovely religious place. It is the place of the temple. The most famous temple are Janki temple, Ram-Lakshman-Sita temple, Nageshwar temple etc. Sitamadhi is 110Kms. from Hajipur and 130 Kms. from Patna. Sitamadhi has a past that pre-dates history.When Sita was going to Ayodhya, She stay and rest here.The place Bodhayan Sar is in Sitamadhi, where lots of MahaKavya is written by Bodhayan.The district of Sitamarhi was carved out of Muzaffarpur district on 11th December 1972. It is situated in the northern part of Bihar. Its headquarter is located at Dumra, five kilometers south of Sitamarhi. The district headquarter was shifted here after the town of Sitamarhi was devastated in one of the worst ever earthquake in January 1934. 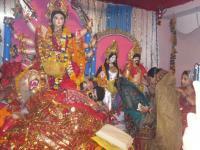 Sitamarhi is a sacred place in Hindu mythology. Itâ€™s history goes back to Treta Yug. Sita, the wife of Lord Rama sprang to life out of an earthern pot, when Raja Janak was ploughing the field somewhere near Sitamarhi to impress upon Lord Indra for rain. It is said that Raja Janak excavated a tank at the place where Sita emerged and after her marriage set up the stone figures of Rama, Sita and Lakshman to mark the site. This tank is known as Janaki-kund and is south of the Janaki Mandir. In course of time, the land lapsed into a jungle until about 500 years ago, when a Hindu ascetic, named Birbal Das came to know the site by divine inspiration where Sita was born. He came down from Ayodhya and cleared the jungle. He found the images set up by Raja Janak, built temple over there and commenced the worship of Janaki or Sita. The Janaki Mandir is apparently modern and is about 100 years old only. The town however contains no relics of archaeological interest. Ucchaitha :- Ucchaitha is a village under Benipatti Subdivion in the district of Madhubani Bihar. 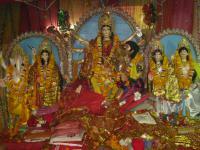 The ancient temple Goddess Devi Bhagwati of great historical importance is situated here. It is 24 km north east of Kamtaul Railway Station of N.E Railway. It is well connected bus root from Darbhanga. 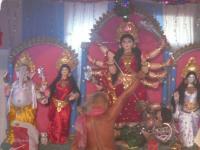 The idol of devi is known to of "Gupt Period". An interested story is associated with the Devi Place one of the greatest poet & one of the nine gold of the court of king Vikramaditya Kalidas got his Education from this place. The story is that Kalidas was a fool boy in his early age. He got married with a very talented women by some pandits. Wnen after marrige the wife of kalidas come to know about it and she refused him which hart him & he left his wife. according to the myth Kalidas come to ucchithaya & darted himself to the pooja of "Maa Durga Bhagwati" and got his kind Blessing and then he become a world famous Poet of his Time and all the Ages. In his writing also he describe the Bleshhing of Maa Bhagwati. Even now people of Mithilanchal come here a take the some of orate ('Mitti") place for different function related to the education of their child like Janau e.t.c with the belive that their child will also became tallented like Kalidas with the blessing of Devi Bhagwati. 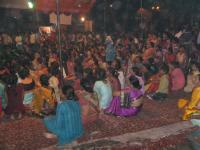 Saurath Sabha:- Saurath Sabha is a place situated in between Madhubani and Rahika. 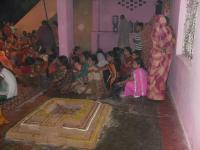 And Saurath sabha is great place in the culture and tradition of Mithila. 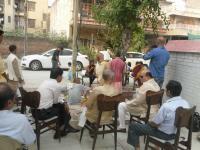 The Saurath Sabha is started by Maharaja Hardeb singh in fourteen century. 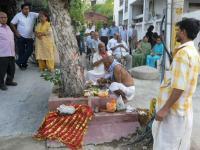 It is a place where nearly 1 or 2 lakh people gather in the month of July for marriage. The traditional process of writing record of marriage called "Sindanth" for Bridge (Dulhan) or Groom(Dulha) System. 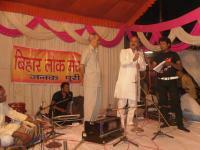 The King Hardev singh also started Registration ("Panjikaran) system for Bridge and Groom. Viratpur Or Vanatpur:-Viratpur is a village under Benipatti Subdivion in the district of Madhubani Bihar.Viratpur is land was king Virat in ancient time. King Virat the father of Uttra and father inlaw of Abhimanyu . Abhimanyu. was son of Arjun and is known for his bravery in the battle of Kurushetra. Uttra was born in Village Uttra near benipatti.The myth about this place was this, in Mahabharat Period pandav's come this place in his last year of forest "Vanvas". Gandiswar:-Gandiswar is a village under Madhwapur Thana in the district of Madhubani Bihar. Gandiwar is famous for it's famous Mahadev temple. The interested story about taht The Pandav's in Mahabharat Period he Escape her Dhanus called Gandiv Dhanus here after this this place is called Gandiswar. In this place a another Mahedav Madir are present called Vaneswar. Vaneswar is a Flower Garden. Balirajpur: - Balirajpur is a village under Benipatti Subdivion in the district of Madhubani Bihar. Balirajpur famous for it Devalya and Breitling Superocean Replica Math.